University leaders, including UConn President Susan Herbst, Interim Provost Mun Choi, and numerous Board of Trustees members, along with a crowd of past and present members of the University community, were among those gathered in Storrs on Wednesday at a ceremony celebrating the official designation of the Philip E. Austin Building. Formerly known as the College of Liberal Arts and Sciences (CLAS) Building, the Philip E. Austin Building honors the leadership of former UConn President Philip Austin, who served as President from October 1996 to September 2007, during which time the University experienced a physical transformation and strengthened its reputation for academic excellence. Austin oversaw the $1 billion UConn 2000 renovation program, and led the start of the $1.3 billion 21st Century UConn program that followed. 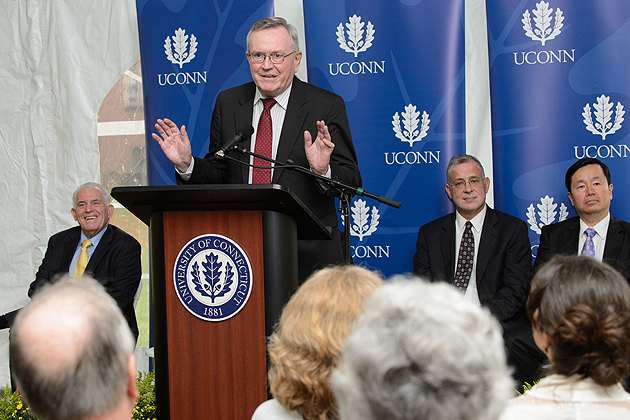 Chairman of the Board of Trustees Lawrence McHugh also thanked Austin for his years of leadership, and for his guidance in driving the transformative UConn 2000 and 21st Century UConn programs, calling him one of the key figures in the life of the University.